Patient privacy has long held a unique place in medical events for families and physicians as codified in the Hippocratic Oath. However, there is a substantial distance between the original oath of confidentiality and current practices. Considering how we normally use the term, “privacy”is relatively rare in a hospital. There are nurses’ stations, active hallways, patient rooms with doors that are seldom closed and public waiting areas where everyone who is there sees and hears everyone else. Furthermore, these waiting areas are designated by the procedure that is occurring (diagnostics, radiology, endoscopy, outpatient surgery, cardiology, etc. ), immediately publicly disclosing the health issue that is at stake. Yet, while a hospitalization occurs in a public institutional setting, the experience of illness and disease lives in the private domain of the patient. Those that care for patients are privy only to the pieces of the patient’s experience that are revealed in carefully constructed exchanges that attempt to capture how pain feels, how much pain is tolerable, how comfortable or uncomfortable the room, bed, bathroom are. 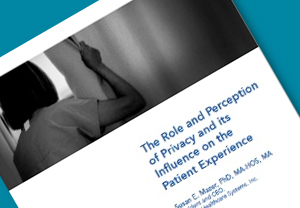 It is ultimately the boundaries between the patient and everyone else, whether physical, social or emotional that define the space called privacy.